The Mazda Miata has traditionally been tasked with one duty: to provide a pure driving experience. However, someone decided to get a little dirty to create the cutest, angriest off-roader we’ve ever seen. 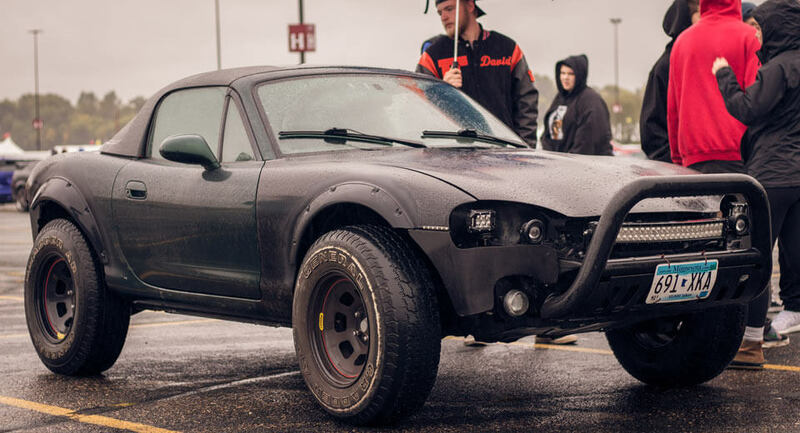 This off-road Miata was spotted at a recent Cars and Coffee event in Minneapolis and subsequently posted to Reddit. It does away with the notion Miatas are only for track days or for hairdressers looking for something fun. No, this Miata looks ready to tussle with an F-150 Raptor. And to its credit, it’ll probably fit places a Raptor won’t. The bumper has been thrown away for a massive bumper bar instead, and instead of headlights, LEDs in the headlight housings provide light. Projector lights also find a home where the NB Miata’s headlights were once fixed. At the back, the owner also removed the rear bumper for additional ground clearance. But, it wouldn’t be an off-roader without a higher ride height, and this mean Miata doesn’t disappoint. Additionally, we see off-road tires and flared wheel arches to make sure the meaty rubber fits properly. We don’t know what kind of off-road action this Miata gets, but we bet it’s quite a bit of fun. It’s unclear if the owner has modified the powertrain at all, but nonetheless, the roadster turned off-roader definitely looks the part.